Prepared by: James A. Bunch, Sabra, Wang, & Associates, Inc. Checked by: Paul Silberman, Sabra, Wang, & Associates, Inc.
Paul Silberman, Sabra, Wang, & Associates, Inc.
Sabra, Wang & Associates, Inc.
­Current state of traffic signal control & TSP systems used in Montgomery County. ­Guidelines for TSP systems on RTS study corridors and the degree/need for consistency with TSP systems used on other county and state highways in Montgomery County. ­Proposed guidelines for agency coordination regarding implementation of TSP on RTS corridors. This technical memorandum is the first of three deliverables associated with the RTS TSP Concept Study. It provides the foundational conceptsneeded to understand what TSP is and what it can offer specific to the context of an RTS framework including service levels and guideway infrastructure. It then describes the goals, objectives, measures and needs for TSP within RTS in Montgomery County. Last it discusses Policy Issues and Challenges to resolve when considering TSP for RTS and Next Steps. Since Councilmember Elrich first proposed a comprehensive countywide Bus Rapid Transit (BRT recast as a Rapid Transit System or RTS) system as a new direction in the County’s transportation system the proposed RTS system has evolved and been refined through several high level conceptual and planning efforts. The initial exploratory Countywide Bus Rapid Transit Study (Parson’s Brinkerhoff, July 2011) examined 23 potential corridors consisting of 198 miles of right of way and recommended 148 miles of right of way (ROW)within 16 corridors. The Montgomery County Transit Task Force then further described the RTS at a conceptual level on what a premium service RTS 162.5 mile 19 corridor network could offer and explored funding /financing options. 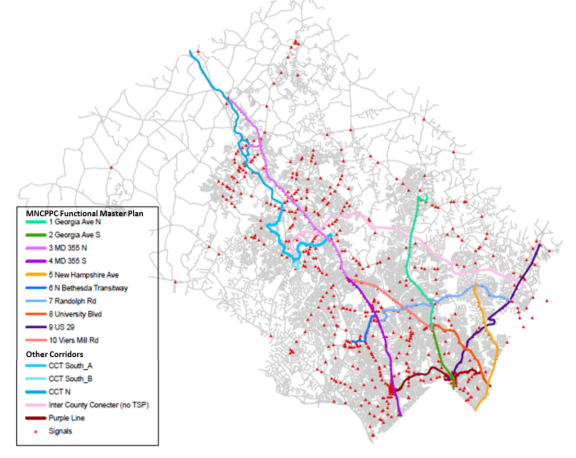 Last, the Countywide Transit Corridors Functional Master Plan was approved by the Maryland National Capitol Park and Planning Commission (MNCPPC) Planning Board in July 2013, and is now being considered by the Montgomery County Council. As shown in Figure 1 it consists of 80.7 miles of Right of Way (ROW) within 10 corridors. 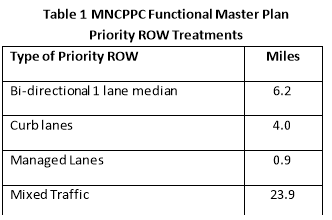 Table 1, shows the types of ROW treatment it assumes determined based upon ROW constraints, potential ridership, and other factors. All of these conceptual efforts assumed that TSP aimed at reducing delay and unreliability due to traffic signals is a key component of a successful RTS system. However, the type of TSP that can be implemented in a particular corridor or intersection and the benefits it generates depend on the type of Priority ROW Treatment, parallel and crossing roadway and intersection traffic operations (level of service), RTS and non-RTS transit service characteristics (the frequency and ridership of the transit service), the vehicle and roadway TSP technologies and other factors that were not examined in these conceptual analyses. This study provides the initial assessment of how to integrate TSP within the RTS given more detailed system, operational, and ROW factors. 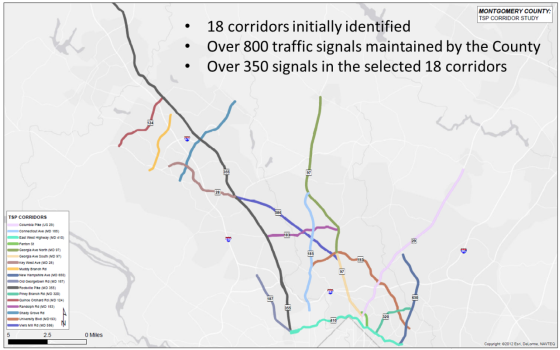 Identified and ranked 18 potential corridors within the county for TSP implementation in the current system based upon inputs from WMATA, RIDE ON, the MTA, and transit and roadway operating characteristics. The potential corridors are shown in Figure 2. Note that many, but not all, of the corridors overlap with the MNCPPC Transit Functional Master Plan. Preliminary analysis indicates that approximately 200signalized intersections along these corridors will meet the criteria for TSP implementation. TSP will be requested only when the buses are running more than 5 minutes behind schedule. A TSP request will be granted on a first come first served basis (no special consideration to direction, corridor, operator, or type of service). A TSP request will be granted only when it can be accommodated safely within the traffic signal controller phases at the intersection. TSP signal options include only green extension and red truncation. Once priority is granted at an intersection the signal cannot grant another request (i.e. the lockout period) until the system recovers coordination (currently assumed to be three cycles). How should potential signal operations change when combined with other priority treatments options (queue jumps, exclusive guideway, etc.)? What types of transit service will be eligible for signal priority (RTS, Express, Local) and in which directions (peak, off-peak, cross)? How often should priority be granted when requested? What weights should be given to transit ridership versus general traffic vehicle and person movements when granting conditional TSP requests? Should the RTS transit operations center be integrated or separate with respect to TSP? It is important to point out at the start of the TSP discussion that implementing and operating TSP within a system by its very nature requires agreements and coordination between operating agencies and across modes. Different agencies/entities own operate and maintain the roadways, traffic signals, and their control/communications systems versus those that may own operate and maintain the RTS and other transit services. 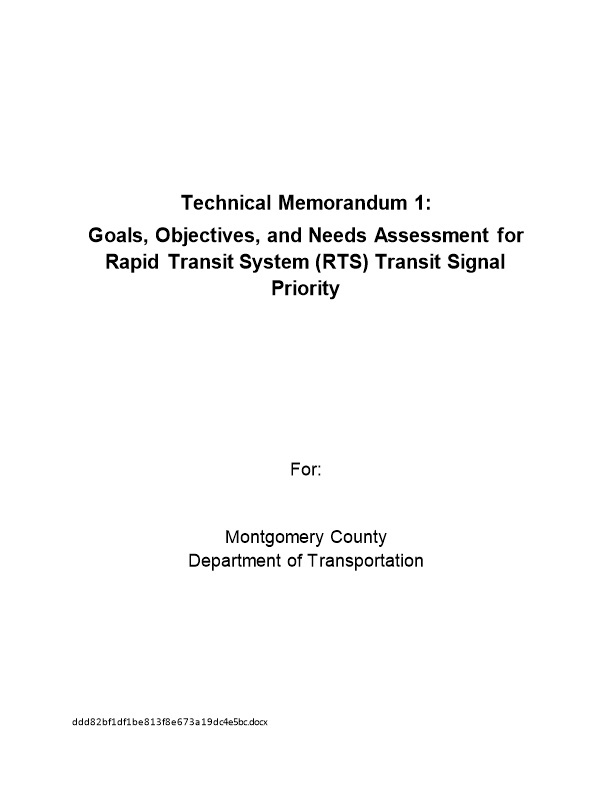 As a framework/policy approach for TSP within the RTS system and how it might be implemented is examined we must keep in mind that the agencies/entitiesthat own operate and maintain the signal systems in Montgomery County have the ultimate decision authority over these systems and must agree with what is being proposed. Of the over 800 signalized intersections in the county, approximately 64% (~ 500) are owned by the Maryland State Highway Administration, with the remainder owned by the county. The MDSHA and County signals are operated by the County. SHA will have to approve the TSP implementation and strategies along state roads, which make up the vast majority of the RTS corridors. Note, that the incorporated cities and towns along RTS corridors also have important roles and responsibilities for their road system performance and operation. The City of Rockville has about 35 signals that they operate in their own closed loop system. Gaithersburg, Takoma Park, and Chevy Chase do not operate or maintain signals but have a vested interest in the performance of their road/traffic system. It will also be important to coordinate with them as we move forward with RTS and TSP. Five sections follow. First, an overview of TSP concepts, operations, and potential impacts is given. Second, it focuses on the potential role of TSP within the overall RTS system including the purpose, goals and objectives and key measures of effectiveness of TSP within RTS. Third, TSP and RTS stakeholders and their needs/concerns are summarized. Forth, potential policy issues and challenges regarding TSP and RTS are discussed. Last, the next steps, are laid out. There is often some confusion over what TSP is, how modern TSP systems operate, and what benefits potential TSP options may offer within the future RTS system. Consequently, this section provides an overview of transit signal priority basic concepts and principles as a foundation for the remainder of the study and discussions within the RTS Steering Committee. In order to better understand what TSP is and how it works one must first understand some basic features of traffic signals themselves. As shown in Figure 3traffic signals typically operate on fixed cycles which repeat over time. A Cycle consists of multiple phases (Figure 3 has 3: North South through, North South left turns, and East West all movements). Phases allocate time to movements competing for shared right-of-way. The length of each phase (green, yellow, and red time) is a function of geometry, and vehicle and pedestrian volumes (demand). Cycle length is sensitive to many factors including coordination with adjacent signals; time of day; volume demand, and vehicle detection (e.g. loops). In Montgomery County cycle lengths typically range from 120 to 180 seconds in the peak period. Providing for vehicle progression along a corridor adjusts the starting time(offsets) of the cycles for signals so that the signals are green as the vehicles move along the corridor in the desired direction of travel. Overall signal coordination and timing optimization efforts aim to adjust the cycle lengths and offsets and phases in order to minimize overall stopped delay due to traffic signals for all traffic throughout the system. TSP is an operational strategy that facilitates the movement of transit vehicles (usually those in service), either buses or streetcars (including BRT and LRT), through traffic-signal controlled intersections (USDOT, FTA, 2005, Page 4). Typical objectives of TSP include improved schedule adherenceand improved transit travel time efficiency while minimizing impact to normal traffic operations (USDOT, FTA, 2005, Page 4). It is important to point out that while they use many of the same systems and components TSP is NOT signal Preemption. TSP modifies normal signal operations to conditionally accommodate requests for priority from transit vehicles. Preemption disrupts signal operations to ensure a green light for emergency and other vehicles that warrant it from safety and other perspectives. The effectiveness and potential benefits of TSP depends greatly on the causes of delay in a particular corridor or situation. TSP focuses on reducing traffic signal delay which on average represents about 15% of a vehicle’s trip time in mixed flow conditions (ITSA, 2004). Causes of signal delay include may include: Accommodating side-street traffic, Special phases (e.g. left-turns only), Pedestrians Crossing, and Volume-related delay (queues). Other causes of delay include dwell time (passenger boardings/alightings, fare collection, and acceleration/deceleration) and traffic delay (congestion and general friction) (Walker, 2011 Chapter 8). Note, that as rapid transit reduces the other causes of delay by providing exclusive guideways, off board fare collection, and quick boarding (low floors, multiple doors), the percentage of delay due to signals increases. Passive Priority adjusts the signal system to favor transit speeds and patterns. An example is designing the signal progression along a corridor based upon the running speed of exclusive guideway rapid transit vehicles between stations (this is likely to be different from the general traffic in adjacent lanes). Passive priority reduces the likelihood of a transit vehicle stopping at a traffic signal when travel times are predictable, and does not require additional technology or equipment on the vehicle or roadside. Passive priority provided travel time savings from 5 to 20% depending on time of day and direction for the Baltimore Howard Street Light Rail Line as well as providing more consistent operations (Kittelson & Associates, 2008). Vehicle Tracking and Detection. Determines where a vehicles is and when it likely to cross the signalized intersection. Some systems also include capturing when the vehicle has passed through the intersection and no longer needs priority. Priority Request Generator (PRG). As a transit vehicle approaches an intersection the PRG determines if it should request priority or not. Systems with unconditional active priority will send a priority request every time an eligible (equipped) vehicle approaches. Systems with conditional active priority will base the request on set criteria such as schedule adherence (is the vehicle late, passenger loading, the direction of travel, type of service (express versus local), or are the doors open/closed. If the vehicle meets the thresholds a priority request is generated and sent. Priority Request Server (PRS). Determines which vehicle will be granted its priority request when multiple requests have been received. It then determines the signal priority strategy (see below) to send to the traffic signal controller for implementation. Note, that if minimum walk times cannot be met, or if there is no available “slack” time within the cycle from other phases then a priority request may not be granted by the PRS. Signal Controller. Implements the signal priority strategy it receives from the PRS by adjusting the available phases within the signal cycle. Note, that logging of priority requests and whether they were granted may also be sent back to the Traffic Management Center. 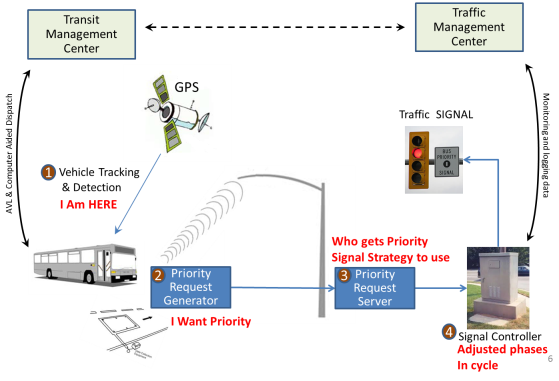 Similarly, the Automatic Vehicle Location and Computer Aided Dispatch systems may be sharing information between the vehicle and the Transit Management Center on current location, schedule adherence, passenger loadings, other transit vehicles etc. Even when the transit and traffic management are collocated at the same center the transit and traffic data often are on separate and disparate systems potentially creating an integration need when TSP performance. This raises an important point, that where and how these functions are implemented depends on the system architecture and the information needed to implement tradeoffs and operational policies of concern to those running the system. Systems can be totally distributed with the PRG and schedule information on the Transit Vehicle and the PRS and decisions to grant priority residing in the field within the signal cabinet. Making tradeoffs between transit vehicles and/or types of transit service or how full the vehicles are may require additional information to be sent to each transit vehicle, or for some decisions to be made at their respective operations centers. Understanding and determining the needs and resultant system architecture and interfaces to implement them is one of the main purposes of the Systems Engineering process.